When working to build better habits (or even break bad ones) at Pavlok we’re a big believer in choosing the one or two habits that will have the most impact. Frequently referred to as ‘keystone habits’ these select habits can quickly improve other seemingly unrelated areas of your life as well. For example, if you start going to the gym, you may find yourself wanting to eat healthier naturally. Once you’ve established a keystone habit, it makes adding more positive habits down the line even easier. One of the best keystone habits to consider implementing in your life is starting your day with a morning routine. Even just 10 minutes with structure in the morning can go a long way in how the rest of your day plays out. Instead of hitting snooze and rushing out the door, you can spend the first couple of minutes doing some light exercise, and then a few minutes meditating. Though simple on the surface, a morning routine is one of the most effective ways to make large strides in other areas of your life. Morning routines are so powerful, that our founder and CEO Maneesh Sethi recently committed to doing his morning routine using the Pavlok app for 30 days straight. Not wanting to lose his hard earned Volts, Maneesh didn’t miss a day. Using negative reinforcement to keep you on track is one of the quickest ways to make any keystone habit you want stick. If you’re wanting to drink more water, for example, tell your spouse or coworker you want to drink 12 glasses of water a day and will pay them 10 dollars per glass that you don’t drink. Commit to incurring a slightly painful consequence if you don’t follow through. While this method of habit building won’t work for everyone, for many people, the thought of having to pay their family or friends (or a terrible organization) money is more than enough motivation to get them to take action. Here’s a simple 4 step process for using a negative reinforcer to help you build a keystone habit of your choice. Define what you will accomplish and the exact consequence if you don’t. I will go to the gym 3x a week if not I will have to buy my friend lunch. I will wake up at 6:15 AM every weekday morning if not I will donate money to a political organization I hate. 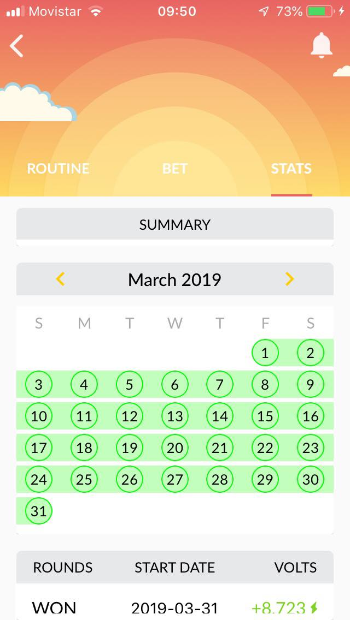 2) Set a negative reinforcer to make sure the habit gets started If using the Pavlok app decide how many Volts you want to wager. Most people think postive reinforcement is the only way to change a habit. But the truth is, negative reinforcement is very important when starting your habit. Think of the time you had to do an essay by a deadline and got it done. Having a consequence for not doing your habit motivates you to take action and follow through. We recommend you choose a monetary penalty or using social shaming to motivate you. If you use the Pavlok app, you will lose the Volt’s you’ve earned if you don’t do your habit. 3) Make a positive reinforcer to make the habit stick for example, winning Volts in the Pavlok app. While negative reinforcers help get habits started, including a postive reinforcer will help you continue building the habit for the long term. Tell your friend that every time you don’t checkin on your phone at the gym M,W,F you will pay them $50 dollars. After you go to the gym you can have your favorite juice smoothy that both tastes good and is relatively healthy. Schedule an embarrassing tweet or Facebook status for just a few minutes after you wake up. If you don’t wake up, the post will automatically be shared. After a few weeks of waking up on time, give yourself permission to sleep in on Saturday. 4) The fourth and final step to making your habits stick is having a someone hold you accountable. Even if following steps 1-3, you won’t always be perfect. Some days you’ll mess up. Some days you just won’t want to go to the gym. Having a coach to hold you accountable is one of the most effective ways to stay on track especially on those days you would rather throw in the towel. We believe coaches are so powerful in helping transform your habits, that we’ve worked tirelessly on our Pavlok habit coaching program, designed specifically to help ensure you reach your habit goals. If you’re interested in changing your habits and having someone in your corner every step of the way, check out our Pavlok Group Coaching page and book a complimentary call with our habit coach. Do whatever you need to build those one or two keystone habits. Once implemented they could make all the difference in other areas of your life as well.